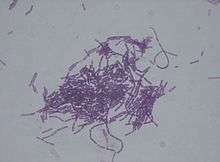 Bacillus thuringiensis (or Bt) is a Gram-positive, soil-dwelling bacterium, commonly used as a biological pesticide. B. thuringiensis also occurs naturally in the gut of caterpillars of various types of moths and butterflies, as well on leaf surfaces, aquatic environments, animal feces, insect-rich environments, and flour mills and grain-storage facilities. During sporulation, many Bt strains produce crystal proteins (proteinaceous inclusions), called δ-endotoxins, that have insecticidal action. This has led to their use as insecticides, and more recently to genetically modified crops using Bt genes, such as Bt corn. Many crystal-producing Bt strains, though, do not have insecticidal properties. B. thuringiensis was first discovered in 1901 by Japanese biologist Ishiwata Shigetane. In 1911, B. thuringiensis was rediscovered in Germany by Ernst Berliner, who isolated it as the cause of a disease called Schlaffsucht in flour moth caterpillars. In 1976, Robert A. Zakharyan reported the presence of a plasmid in a strain of B. thuringiensis and suggested the plasmid's involvement in endospore and crystal formation. B. thuringiensis is closely related to B.cereus, a soil bacterium, and B.anthracis, the cause of anthrax; the three organisms differ mainly in their plasmids. :34–35 Like other members of the genus, all three are aerobes capable of producing endospores. The are several dozen recognized subspecies of bacillus thuringiensis. Subspecies commonly used as insecticides include Bacillus thuringiensis subspecies kurstaki (Btk) and subspecies israelensis (Bti) and subspecies aizawa (Bta). Upon sporulation, B. thuringiensis forms crystals of proteinaceous insecticidal δ-endotoxins (called crystal proteins or Cry proteins), which are encoded by cry genes. In most strains of B. thuringiensis, the cry genes are located on a plasmid (cry is not a chromosomal gene in most strains). Cry toxins have specific activities against insect species of the orders Lepidoptera (moths and butterflies), Diptera (flies and mosquitoes), Coleoptera (beetles), Hymenoptera (wasps, bees, ants and sawflies) and nematodes. Thus, B. thuringiensis serves as an important reservoir of Cry toxins for production of biological insecticides and insect-resistant genetically modified crops. When insects ingest toxin crystals, their alkaline digestive tracts denature the insoluble crystals, making them soluble and thus amenable to being cut with proteases found in the insect gut, which liberate the toxin from the crystal. The Cry toxin is then inserted into the insect gut cell membrane, paralyzing the digestive tract and forming a pore. The insect stops eating and starves to death; live Bt bacteria may also colonize the insect which can contribute to death. The midgut bacteria of susceptible larvae may be required for B. thuringiensis insecticidal activity. In 1996 another class of insecticidal proteins in Bt was discovered; the vegetative insecticidal proteins (Vip). Vip proteins do not share sequence homology with Cry proteins, in general do not compete for the same receptors, and some kill different insects than do Cry proteins. In 2000, a novel functional group of Cry protein, designated parasporin, was discovered from noninsecticidal B. thuringiensis isolates. The proteins of parasporin group are defined as B. thuringiensis and related bacterial parasporal proteins that are not hemolytic, but capable of preferentially killing cancer cells. As of January 2013, parasporins comprise six subfamilies (PS1 to PS6). Spores and crystalline insecticidal proteins produced by B. thuringiensis have been used to control insect pests since the 1920s and are often applied as liquid sprays. 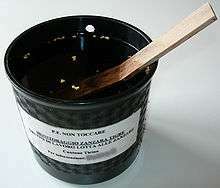 They are now used as specific insecticides under trade names such as DiPel and Thuricide. Because of their specificity, these pesticides are regarded as environmentally friendly, with little or no effect on humans, wildlife, pollinators, and most other beneficial insects, and are used in organic farming; however, the manuals for these products do contain many environmental and human health warnings, and a 2012 European regulatory peer review of five approved strains found, while data exist to support some claims of low toxicity to humans and the environment, the data are insufficient to justify many of these claims. New strains of Bt are developed and introduced over time as insects develop resistance to Bt, or the desire occurs to force mutations to modify organism characteristics or to use homologous recombinant genetic engineering to improve crystal size and increase pesticidal activity or broaden the host range of Bt and obtain more effective formulations. Each new strain is given a unique number and registered with the U.S. EPA and allowances may be given for genetic modification depending on "its parental strains, the proposed pesticide use pattern, and the manner and extent to which the organism has been genetically modified". Formulations of Bt that are approved for organic farming in the US are listed at the website of the Organic Materials Review Institute (OMRI) and several university extension websites offer advice on how to use Bt spore or protein preparations in organic farming. The Belgian company Plant Genetic Systems (now part of Bayer CropScience) was the first company (in 1985) to develop genetically modified crops (tobacco) with insect tolerance by expressing cry genes from B. thuringiensis; the resulting crops contain delta endotoxin. The Bt tobacco was never commercialized; tobacco plants are used to test genetic modifications since they are easy to manipulate genetically and are not part of the food supply. 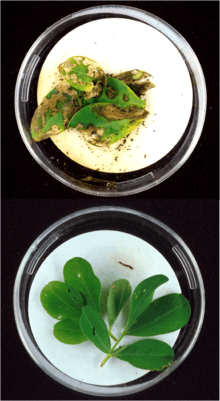 Bt toxins present in peanut leaves (bottom dish) protect it from extensive damage caused by Lesser Cornstalk Borer larvae (top dish). In 1995, potato plants producing CRY 3A Bt toxin were approved safe by the Environmental Protection Agency, making it the first human-modified pesticide-producing crop to be approved in the USA, though many plants produce pesticides naturally, including tobacco, coffee plants, cocoa, and black walnut. This was the 'New Leaf' potato, and it was removed from the market in 2001 due to lack of interest. For current crops and their acreage under cultivation, see genetically modified crops. In 1996, genetically modified maize producing Bt Cry protein was approved, which killed the European corn borer and related species; subsequent Bt genes were introduced that killed corn rootworm larvae. Corn genetically modified to produce VIP was first approved in the US in 2010. In India, by 2014, more than seven million cotton farmers, occupying twenty-six million acres, had adopted Bt cotton. Monsanto developed a soybean expressing Cry1Ac and the glyphosate-resistance gene for the Brazilian market, which completed the Brazilian regulatory process in 2010. The use of Bt toxins as plant-incorporated protectants prompted the need for extensive evaluation of their safety for use in foods and potential unintended impacts on the environment. Concerns over the safety of consumption of genetically-modified plant materials that contain Cry proteins have been addressed in extensive dietary risk assessment studies. While the target pests are exposed to the toxins primarily through leaf and stalk material, Cry proteins are also expressed in other parts of the plant, including trace amounts in maize kernels which are ultimately consumed by both humans and animals. Animal models have been used to assess human health risk from consumption of products containing Cry proteins. The United States Environmental Protection Agency recognizes mouse acute oral feeding studies where doses as high as 5,000 mg/kg body weight resulted in no observed adverse effects. Research on other known toxic proteins suggests that toxicity occurs at much lower doses, further suggesting that Bt toxins are not toxic to mammals. The results of toxicology studies are further strengthened by the lack of observed toxicity from decades of use of B. thuringiensis and its crystalline proteins as an insecticidal spray. Introduction of a new protein raised concerns regarding the potential for allergic responses in sensitive individuals. Bioinformatic analysis of known allergens has indicated there is no concern of allergic reactions as a result of consumption of Bt toxins. Additionally, skin prick testing using purified Bt protein resulted in no detectable production of toxin-specific IgE antibodies, even in atopic patients. Studies have been conducted to evaluate the fate of Bt toxins that are ingested in foods. Bt toxin proteins have been shown to digest within minutes of exposure to simulated gastric fluids. The instability of the proteins in digestive fluids is an additional indication that Cry proteins are unlikely to be allergenic, since most known food allergens resist degradation and are ultimately absorbed in the small intestine. Ecological risk assessment aims to ensure there is no unintended impact on non-target organisms and no contamination of natural resources as a result of the use of a new substance, such as the use of Bt in genetically-modified crops. The impact of Bt toxins on the environments where transgenic plants are grown has been evaluated to ensure no adverse effects outside of targeted crop pests. Concerns over possible environmental impact from accumulation of Bt toxins from plant tissues, pollen dispersal, and direct secretion from roots have been investigated. Bt toxins may persist in soil for over 200 days, with half-lives between 1.6 and 22 days. Much of the toxin is initially degraded rapidly by microorganisms in the environment, while some is adsorbed by organic matter and persists longer. Some studies, in contrast, claim that the toxins do not persist in the soil. Bt toxins are less likely to accumulate in bodies of water, but pollen shed or soil runoff may deposit them in an aquatic ecosystem. Fish species are not susceptible to Bt toxins if exposed. The toxic nature of Bt proteins has an adverse impact on many major crop pests, but ecological risk assessments have been conducted to ensure safety of beneficial non-target organisms that may come into contact with the toxins. Widespread concerns over toxicity in non-target Lepidopterans, such as the monarch butterfly, have been disproved through proper exposure characterization, where it was determined that non-target organisms are not exposed to high enough amounts of the Bt toxins to have an adverse effect on the population. Soil-dwelling organisms, potentially exposed to Bt toxins through root exudates, are not impacted by the growth of Bt crops. In November 2009, Monsanto scientists found the pink bollworm had become resistant to the first-generation Bt cotton in parts of Gujarat, India - that generation expresses one Bt gene, Cry1Ac. This was the first instance of Bt resistance confirmed by Monsanto anywhere in the world. Monsanto immediately responded by introducing a second-generation cotton with multiple Bt proteins, which was rapidly adopted. Bollworm resistance to first-generation Bt cotton was also identified in Australia, China, Spain, and the United States. Several studies have documented surges in "sucking pests" (which are not affected by Bt toxins) within a few years of adoption of Bt cotton. In China, the main problem has been with mirids, which have in some cases "completely eroded all benefits from Bt cotton cultivation". The increase in sucking pests depended on local temperature and rainfall conditions and increased in half the villages studied. The increase in insecticide use for the control of these secondary insects was far smaller than the reduction in total insecticide use due to Bt cotton adoption. Another study in five provinces in China found the reduction in pesticide use in Bt cotton cultivars is significantly lower than that reported in research elsewhere, consistent with the hypothesis suggested by recent studies that more pesticide sprayings are needed over time to control emerging secondary pests, such as aphids, spider mites, and lygus bugs. Similar problems have been reported in India, with both mealy bugs and aphids although a survey of small Indian farms between 2002 and 2008 concluded Bt cotton adoption has led to higher yields and lower pesticide use, decreasing over time. There are controversies around GMOs on several levels, including whether making them is ethical, whether food produced with them is safe, whether such food should be labeled and if so how, whether agricultural biotech is needed to address world hunger now or in the future, and more specifically to GM crops—intellectual property and market dynamics; environmental effects of GM crops; and GM crops' role in industrial agricultural more generally. There are also issues specific to Bt transgenic crops. The most publicised problem associated with Bt crops is the claim that pollen from Bt maize could kill the monarch butterfly. The paper produced a public uproar and demonstrations against Bt maize; however by 2001 several follow-up studies coordinated by the USDA had proven that "the most common types of Bt maize pollen are not toxic to monarch larvae in concentrations the insects would encounter in the fields." A study published in Nature in 2001 reported Bt-containing maize genes were found in maize in its center of origin, Oaxaca, Mexico. In 2002, paper concluded, "the evidence available is not sufficient to justify the publication of the original paper." A significant controversy happened over the paper and Nature's unprecedented notice. A subsequent large-scale study, in 2005, failed to find any evidence of genetic mixing in Oaxaca. A 2007 study found the "transgenic proteins expressed in maize were found in two (0.96%) of 208 samples from farmers' fields, located in two (8%) of 25 sampled communities." Mexico imports a substantial amount of maize from the US, and due to formal and informal seed networks among rural farmers, many potential routes are available for transgenic maize to enter into food and feed webs. One study found small-scale (about 1%) introduction of transgenic sequences in sampled fields in Mexico; it did not find evidence for or against this introduced genetic material being inherited by the next generation of plants. That study was immediately criticized, with the reviewer writing, "Genetically, any given plant should be either nontransgenic or transgenic, therefore for leaf tissue of a single transgenic plant, a GMO level close to 100% is expected. In their study, the authors chose to classify leaf samples as transgenic despite GMO levels of about 0.1%. We contend that results such as these are incorrectly interpreted as positive and are more likely to be indicative of contamination in the laboratory." As of 2007, a new phenomenon called colony collapse disorder (CCD) began affecting bee hives all over North America. Initial speculation on possible causes included new parasites, pesticide use, and the use of Bt transgenic crops. The Mid-Atlantic Apiculture Research and Extension Consortium found no evidence that pollen from Bt crops is adversely affecting bees. According to the USDA, "Genetically modified (GM) crops, most commonly Bt corn, have been offered up as the cause of CCD. But there is no correlation between where GM crops are planted and the pattern of CCD incidents. Also, GM crops have been widely planted since the late 1990s, but CCD did not appear until 2006. In addition, CCD has been reported in countries that do not allow GM crops to be planted, such as Switzerland. German researchers have noted in one study a possible correlation between exposure to Bt pollen and compromised immunity to Nosema." The actual cause of CCD was unknown in 2007, and scientists believe it may have multiple exacerbating causes. Some isolates of B. thuringiensis produce a class of insecticidal small molecules called beta-exotoxin, the common name for which is thuringiensin. A consensus document produced by the OECD says: "Beta-exotoxin and the other Bacillus toxins may contribute to the insecticidal toxicity of the bacterium to lepidopteran, dipteran, and coleopteran insects. Beta-exotoxin is known to be toxic to humans and almost all other forms of life and its presence is prohibited in B. thuringiensis microbial products. Engineering of plants to contain and express only the genes for δ-endotoxins avoids the problem of assessing the risks posed by these other toxins that may be produced in microbial preparations." An Ovitrap, a tool for the collection of eggs from tiger mosquitoes: In this case, an ovitrap type used for the monitoring of the Asian tiger mosquito Aedes albopictus in the Swiss canton of Ticino. The presence of the mosquitoes is detected through the eggs they lay on the wooden paddle or from larvae that hatch from these eggs in the laboratory. The brown granules in the water are a Bacillus thuringiensis israelensis preparation that will kill mosquito larvae that hatch in the ovitrap. Ovitraps are also used to monitor the yellow fever mosquito Aedes aegypti. 1 2 Madigan, Michael T.; Martinko, John M., eds. (2005). Brock Biology of Microorganisms (11th ed.). Prentice Hall. ISBN 978-0-13-144329-7. ↑ du Rand, Nicolette (July 2009). Isolation of Entomopathogenic Gram Positive Spore Forming Bacteria Effective Against Coleoptera (PhD Thesis). Pietermaritzburg, South Africa: University of KwaZulu-Natal. hdl:10413/1235. ↑ Kumar, PA; Malik, VS; Sharma, RP (1996). "Insecticidal proteins of Bacillus thuringiensis". Advances in Applied Microbiology. 42: 1–43. 1 2 Roh, JY; Choi, JY; Li, MS; Jin, BR; Je, YH (2007). "Bacillus thuringiensis as a specific, safe, and effective tool for insect pest control". Journal of microbiology and biotechnology. 17 (4): 547–59. PMID 18051264. ↑ Ibrahim, Mohamed. "Bacillus thuringiensis". Bioengineered Bugs. 1: 31–50. doi:10.4161/bbug.1.1.10519. PMC 3035146 . PMID 21327125. ↑ Zakharyan R.A et. el. (1979). "Plasmid DNA from Bacillus thuringiensis". Microbiologiya. 48 (2): 226–9. ISSN 0026-3656. ↑ Cheng, Thomas Clement, ed. (1984). Pathogens of invertebrates: application in biological control and transmission mechanisms. p. 159. ISBN 978-0-306-41700-9. ↑ Poopathi, Subbiah; Abidha, S. (2010). "Mosquitocidal bacterial toxins (Bacillus sphaericus and B. thuringiensis serovar israelensis): Mode of action, cytopathological effects and mechanism of resistance". Journal of Physiology and Pathophysiology. 1 (3): 22–38. ↑ Circkmore N. "Bacillus thuringiensis toxin nomenclature". Archived from the original on 9 October 2008. Retrieved 2008-11-23. 1 2 3 Dean, Donald H (1984). "Biochemical genetics of the bacterial insect-control agent Bacillus thuringiensis: Basic principles and prospects for genetic engineering" (PDF). Biotechnology & Genetic Engineering Reviews. 2: 341–63. doi:10.1080/02648725.1984.10647804. PMID 6443645. ↑ Beegle, Clayton C.; Yamamoto, Takashi (1992). "Invitation Paper (C.p. Alexander Fund): History Of bacillus Thuringiensis berliner Research and Development". The Canadian Entomologist. 124 (4): 587–616. doi:10.4039/Ent124587-4. ↑ Xu, Jian; Liu, Qin; Yin, Xiang-dong; Zhu, Shu-de (2006). "A review of recent development of Bacillus thuringiensis ICP genetically engineered microbes". Entomological Journal of East China. 15 (1): 53–8. ↑ Babu M, Geetha M. "DNA shuffling of Cry proteins". Retrieved 2008-11-23. ↑ Broderick, Nichole A.; Raffa, Kenneth F.; Handelsman, Jo (2006). "Midgut bacteria required for Bacillus thuringiensis insecticidal activity". Proceedings of the National Academy of Sciences. 103 (41): 15196–9. Bibcode:2006PNAS..10315196B. doi:10.1073/pnas.0604865103. JSTOR 30051525. PMC 1622799 . PMID 17005725. 1 2 Palma, L; et al. (October 2012). "Vip3C, a Novel Class of Vegetative Insecticidal Proteins from Bacillus thuringiensis". Appl Environ Microbiol. 78 (19): 7163–7165. doi:10.1128/AEM.01360-12. PMC 3457495 . PMID 22865065. ↑ Estruch, JJ; Warren, GW; Mullins, MA; et al. (1996). "Vip3A, a novel Bacillus thuringiensis vegetative insecticidal protein with a wide spectrum of activities against lepidopteran insects". Proc Natl Acad Sci U S A. 93 (11): 5389–94. Bibcode:1996PNAS...93.5389E. doi:10.1073/pnas.93.11.5389. PMID 8643585. ↑ Mizuki, Eiichi; Park, Yu Shin; Saitoh, Hiroyuki; Yamashita, Satoko; Akao, Tetsuyuki; Higuchi, Kazuhiko; Ohba, Michio (2000). "Parasporin, a Human Leukemic Cell-Recognizing Parasporal Protein of Bacillus thuringiensis". Clinical and Vaccine Immunology. 7 (4): 625–34. doi:10.1128/CDLI.7.4.625-634.2000. PMC 95925 . PMID 10882663. ↑ Ohba, Michio; Mizuki, Eiichi; Uemori, Akiko (2009). "Parasporin, a New Anticancer Protein Group from Bacillus thuringiensis". Anticancer Research. 29 (1): 427–33. PMID 19331182. ↑ Lemaux, Peggy G. (2008). "Genetically Engineered Plants and Foods: A Scientist's Analysis of the Issues (Part I)". Annual Review of Plant Biology. 59: 771–812. doi:10.1146/annurev.arplant.58.032806.103840. PMID 18284373. ↑ Wei, Jun-Zhi; Hale, Kristina; Carta, Lynn; Platzer, Edward; Wong, Cynthie; Fang, Su-Chiung; Aroian, Raffi V. (2003). "Bacillus thuringiensis crystal proteins that target nematodes". Proceedings of the National Academy of Sciences. 100 (5): 2760–5. Bibcode:2003PNAS..100.2760W. doi:10.1073/pnas.0538072100. JSTOR 3139601. PMC 151414 . PMID 12598644. Lay summary – University of California, San Diego, Division of Biological Sciences (19 February 2003). ↑ DiPelProDf data sheet Archived September 8, 2013, at the Wayback Machine. ↑ DiPelProDf data sheet Archived March 13, 2014, at the Wayback Machine. ↑ Hayes' Handbook of Pesticide Toxicology, Volume 1. Academic Press, imprint of Elsevier. 2010. pp. 442–443. ↑ Huang, F.; Buschman, L. L.; Higgins, R. A. (2001). "Larval feeding behavior of Dipel-resistant and susceptible Ostrinia nubilalis on diet containing Bacillus thuringiensis (Dipel ES™)". Entomologia Experimentalis et Applicata. 98: 141–148. doi:10.1046/j.1570-7458.2001.00768.x. ↑ "Novel Bacillus thuringiensis isolate". USPTO. 1987. US4910016. 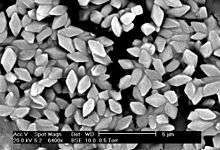 ↑ "Formation of and methods for the production of large bacillus thuringiensis crystals with increased pesticidal activity". USPTO. 1996. US6303382. ↑ "Production of bacillus thuringiensis integrants". USPTO. 1998. US5955367. ↑ Pesticides; Data Requirements for Biochemical and Microbial Pesticides. U.S. Environmental Protection Agency (EPA). Final Rule. ↑ 40 CFR 158.2100 - Microbial pesticides definition and applicability. ↑ Caldwell, Brian; Sideman, Eric; Seaman, Abby; Shelton, Anthony; Smart, Christine, eds. (2013). "Material Fact Sheet: Bacillus thuringiensis (Bt)" (PDF). Resource Guide for Organic Insect and Disease Management (2nd ed.). pp. 109–12. ISBN 0-9676507-8-X. ↑ Cranshaw, W.S. (November 2, 2012). "Bacillus thuringiensis Fact Sheet". Colorado State University Extension Service. ↑ Hofte, Herman; Greve, Henri; Seurinck, Jef; et al. (1986). "Structural and functional analysis of a cloned delta endotoxin of Bacillus thuringiensis berliner 1715". European Journal of Biochemistry. 161 (2): 273–80. doi:10.1111/j.1432-1033.1986.tb10443.x. PMID 3023091. ↑ Vaeck, Mark; Reynaerts, Arlette; Höfte, Herman; et al. (1987). "Transgenic plants protected from insect attack". Nature. 328 (6125): 33–7. Bibcode:1987Natur.328...33V. doi:10.1038/328033a0. ↑ Key, S; Ma, JK; Drake, PM (Jun 2008). "Genetically modified plants and human health". J R Soc Med. 101 (6): 290–8. doi:10.1258/jrsm.2008.070372. PMC 2408621 . PMID 18515776. ↑ Jan Suszkiw (November 1999). "Tifton, Georgia: A Peanut Pest Showdown". Agricultural Research magazine. Archived from the original on 12 October 2008. Retrieved 2008-11-23. ↑ Staff, CERA. NewLeaf Entry in CERA Archived August 12, 2014, at the Wayback Machine. ↑ "The History and Future of GM Potatoes". PotatoPro Newsletter. March 10, 2010. ↑ Hellmich, R. L.; Hellmich, K. A. (2012). 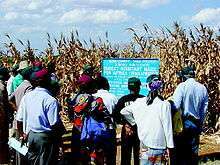 "Use and Impact of Bt Maize". Nature Education Knowledge. 3 (10): 4. ↑ Erin Hodgson and Aaron Gassmann, Iowa State Extension, Department of Entomology. May 2010. New Corn Trait Deregulated in U.S.
↑ Staff, Monsanto. August, 2009. Application for authorization to place on the market MON 87701 × MON 89788 soybean in the European Union, according to Regulation (EC) No 1829/2003 on genetically modified food and feed Linked from the GMO Compass page on the MON87701 x MON89788 event. ↑ Fearing, P.L., Brown, D., Vlachos, D., Meghji, M., L. Privalle. 1997. Quantitative analysis of Cry1A(b) expression in Bt maize plants, tissues, and silage and stability of expression over generations. Mol. Breed. 3:169-176. ↑ Sjoblad, R.D. ; McClintock, J.T. ; Engler, R. (1992). "Toxicological considerations for protein components of biological pesticide products". Regul. Toxicol. and Pharmacol. 15: 3–9. doi:10.1016/0273-2300(92)90078-n.
↑ Randhawa, G.J. ; Singh, M.; Grover, M. (2011). "Bioinformatic analysis for allergenicity assessment of Bacillus thuringiensis Cry proteins expressed in insect-resistant food crops". Food Chem. Toxicol. 49 (2): 356–362. doi:10.1016/j.fct.2010.11.008. ↑ Batista, R.; Nunez, B.; Carmo, M.; Cardozo, C.; Jose, H. Sao; et al. (2005). "Lack of detectable allergenicity of transgenic maize and soya samples". J. Allergy Clin. Immunol. 116 (2): 403–410. doi:10.1016/j.jaci.2005.04.014. ↑ Betz, F.S. ; Hammond, B.G. ; Fuchs, R.L. (2000). "Safety and advantages of Bacillus thuringiensis-protected plants to control pests". Regul. Toxicol. and Pharmacol. 32: 156–173. ↑ Astwood, J.D. ; Leach, J.N. ; Fuchs, R.L. (1996). "Stability of food allergens to in vitro digestion". Nat. Biotechnol. 14: 1269–1273. doi:10.1038/nbt1096-1269. 1 2 Helassa, N.; Quiquampoix, H.; Staunton, S. (2013). "Structure, Biological Activity and Environmental Fate of Insecticidal Bt (Bacillus thuringiensis) Cry Proteins of Bacterial and Genetically Modified Plant Origin". In Xu, J.; Sparks, D. Molecular Environmental Soil Science. Springer Netherlands. pp. 49–77. ISBN 978-94-007-4177-5. ↑ Dubelman, S.; Ayden, B.R. ; Bader, B.M. ; Brown, C.R. ; Jiang, C.; Vlachos, D. (2005). "Cry1Ab Protein Does Not Persist in Soil After 3 Years of Sustained Bt Corn Use". Environ. Entomol. 34 (4): 915–921. doi:10.1603/0046-225x-34.4.915. ↑ Head, G.; Surber, J.B.; Watson, J.A. ; Martin, J.W. ; Duan, J.J. (2002). "No Detection of Cry1Ac Protein in Soil After Multiple Years of Transgenic Bt Cotton (Bollgard) Use". Environ. Entomol. 31 (1): 30–36. ↑ Clark, B.W. ; Phillips, T.A. ; Coats, J.R. (2005). "Environmental Fate and Effects of Bacillus thuringiensis (Bt)Proteins from Transgenic Crops: a Review" (PDF). J. Agric. Food Chem. 53: 4643–4653. doi:10.1021/jf040442k. ↑ Sears, M.K. ; et al. (2001). "Impact of Bt corn on monarch butterfly populations: A risk assessment". Proc. Natl. Acad. Sci. USA. 98 (21): 11937–11942. doi:10.1073/pnas.211329998. PMC 59819 . PMID 11559842. ↑ Saxena, D.; Stotzky, G. (2000). "Bacillus thuringiensis (Bt) toxin released from root exudates and biomass of Bt corn has no apparent effect on earthworms, nematodes, protozoa, bacteria, and fungi in soil" (PDF). Soil Biology & Biochemistry. 33: 1225–1230. doi:10.1016/s0038-0717(01)00027-x. 1 2 "Cotton in India". Monsanto.com. 2008-11-03. Retrieved 2013-07-09. ↑ Bagla, P. (2010). "Hardy Cotton-Munching Pests Are Latest Blow to GM Crops". Science. 327 (5972): 1439. Bibcode:2010Sci...327.1439B. doi:10.1126/science.327.5972.1439. PMID 20299559. ↑ Tabashnik, Bruce E; Gassmann, Aaron J; Crowder, David W; Carriére, Yves (2008). "Insect resistance to Bt crops: Evidence versus theory". Nature Biotechnology. 26 (2): 199–202. doi:10.1038/nbt1382. PMID 18259177. ↑ Lu, Y; Wu, K; Jiang, Y; Xia, B; Li, P; Feng, H; Wyckhuys, KA; Guo, Y (2010). "Mirid bug outbreaks in multiple crops correlated with wide-scale adoption of Bt cotton in China". Science. 328 (5982): 1151–4. Bibcode:2010Sci...328.1151L. doi:10.1126/science.1187881. PMID 20466880. ↑ Just, David R.; Wang, Shenghui; Pinstrup-Andersen, Per (2006). Tarnishing Silver Bullets: Bt Technology Adoption, Bounded Rationality and the Outbreak of Secondary Pest Infestations in China. American Agricultural Economics Association Annual Meeting. Long Beach, CA. Lay summary – Cornell Chronicle (July 25, 2006). ↑ Wang, Shenghui; Just, David R.; Pinstrup-Andersen, Per (2008). "Bt-cotton and secondary pests". International Journal of Biotechnology. 10 (2/3): 113–21. doi:10.1504/IJBT.2008.018348. ↑ Wang, Zi-jun; Lin, Hai; Huang, Ji-kun; Hu, Rui-fa; Rozelle, Scott; Pray, Carl (2009). "Bt Cotton in China: Are Secondary Insect Infestations Offsetting the Benefits in Farmer Fields?". Agricultural Sciences in China. 8: 83–90. doi:10.1016/S1671-2927(09)60012-2. ↑ Zhao, Jennifer H.; Ho, Peter; Azadi, Hossein (2010). "Benefits of Bt cotton counterbalanced by secondary pests? Perceptions of ecological change in China". Environmental Monitoring and Assessment. 173 (1–4): 985–94. doi:10.1007/s10661-010-1439-y. PMID 20437270. ; Erratum published 2012 Aug 5: Zhao, Jennifer H.; Ho, Peter; Azadi, Hossein (2012). "Erratum to: Benefits of Bt cotton counterbalanced by secondary pests? Perceptions of ecological change in China". Environmental Monitoring and Assessment. 184 (11): 7079. doi:10.1007/s10661-012-2699-5. ↑ Stone, Glenn Davis (2011). "Field versus Farm in Warangal: Bt Cotton, Higher Yields, and Larger Questions". World Development. 39 (3): 387–98. doi:10.1016/j.worlddev.2010.09.008. ↑ Krishna, Vijesh V.; Qaim, Matin (2012). "Bt cotton and sustainability of pesticide reductions in India". Agricultural Systems. 107: 47–55. doi:10.1016/j.agsy.2011.11.005. ↑ Losey, John E.; Rayor, Linda S.; Carter, Maureen E. (1999). "Transgenic pollen harms monarch larvae". Nature. 399 (6733): 214. Bibcode:1999Natur.399..214L. doi:10.1038/20338. PMID 10353241. ↑ Mendelsohn, Mike; Kough, John; Vaituzis, Zigfridais; Matthews, Keith (2003). "Are Bt crops safe?". Nature Biotechnology. 21 (9): 1003–9. doi:10.1038/nbt0903-1003. PMID 12949561. ↑ Hellmich, Richard L.; Siegfried, Blair D.; Sears, Mark K.; et al. (2001). "Monarch larvae sensitivity to Bacillus thuringiensis- purified proteins and pollen". Proceedings of the National Academy of Sciences. 98 (21): 11925–30. Bibcode:2001PNAS...9811925H. doi:10.1073/pnas.211297698. JSTOR 3056825. PMC 59744 . PMID 11559841. ↑ "Bt Corn and Monarch Butterflies". USDA Agricultural Research Service. 2004-03-29. Archived from the original on 6 November 2008. Retrieved 2008-11-23. ↑ Quist, D; Chapela, IH (2001). "Transgenic DNA introgressed into traditional maize landraces in Oaxaca, Mexico". Nature. 414 (6863): 541–3. Bibcode:2001Natur.414..541Q. doi:10.1038/35107068. PMID 11734853. ↑ Kaplinsky, N; Braun, D; Lisch, D; Hay, A; Hake, S; Freeling, M (2002). "Biodiversity (Communications arising): Maize transgene results in Mexico are artefacts". Nature. 416 (6881): 601–2; discussion 600, 602. Bibcode:2002Natur.416..601K. doi:10.1038/nature739. PMID 11935145. ↑ Ortiz-García, S; Ezcurra, E; Schoel, B; Acevedo, F; Soberón, J; Snow, AA (2005). "Absence of detectable transgenes in local landraces of maize in Oaxaca, Mexico (2003-2004)". Proceedings of the National Academy of Sciences of the United States of America. 102 (35): 12338–43. Bibcode:2005PNAS..10212338O. doi:10.1073/pnas.0503356102. JSTOR 3376579. PMC 1184035 . PMID 16093316. ↑ Serratos-Hernández, José-Antonio; Gómez-Olivares, José-Luis; Salinas-Arreortua, Noé; Buendía-Rodríguez, Enrique; Islas-Gutiérrez, Fabián; De-Ita, Ana (2007). "Transgenic proteins in maize in the Soil Conservation area of Federal District, Mexico". Frontiers in Ecology and the Environment. 5 (5): 247–52. doi:10.1890/1540-9295(2007)5[247:TPIMIT]2.0.CO;2. ISSN 1540-9295. ↑ Piñeyro-Nelson, A; Van Heerwaarden, J; Perales, HR; et al. (2009). "Transgenes in Mexican maize: Molecular evidence and methodological considerations for GMO detection in landrace populations". Molecular Ecology. 18 (4): 750–61. doi:10.1111/j.1365-294X.2008.03993.x. PMC 3001031 . PMID 19143938. ↑ Dalton, Rex (2008). "Modified genes spread to local maize". Nature. 456 (7219): 149. doi:10.1038/456149a. PMID 19005518. ↑ Schoel, Bernd; Fagan, John (2009). "Insufficient evidence for the discovery of transgenes in Mexican landraces". Molecular Ecology. 18 (20): 4143–4; discussion 4145–50. doi:10.1111/j.1365-294X.2009.04368.x. PMID 19793201. ↑ "ARS : Questions and Answers: Colony Collapse Disorder". ARS News. 2008-05-29. Archived from the original on 5 November 2008. Retrieved 2008-11-23. ↑ Latsch, Gunther (March 22, 2007). "Are GM Crops Killing Bees?". Spiegel Online. ↑ Rose, Robyn; Dively, Galen P.; Pettis, Jeff (2007). "Effects of Bt corn pollen on honey bees: Emphasis on protocol development". Apidologie. 38 (4): 368–77. doi:10.1051/apido:2007022. ↑ McGrath, Matt (5 March 2009). "'No proof' of bee killer theory". BBC News. ↑ "EPA pesticide database". Ofmpub.epa.gov. 2010-11-17. Retrieved 2013-07-09. De Maagd, R; Bravo, A; Crickmore, N (2001). "How Bacillus thuringiensis has evolved specific toxins to colonize the insect world". Trends in Genetics. 17 (4): 193–9. doi:10.1016/S0168-9525(01)02237-5. PMID 11275324. Bravo, Alejandra; Gill, Sarjeet S.; Soberón, Mario (2007). "Mode of action of Bacillus thuringiensis Cry and Cyt toxins and their potential for insect control". Toxicon. 49 (4): 423–35. doi:10.1016/j.toxicon.2006.11.022. PMC 1857359 . PMID 17198720. Pigott, C. R.; Ellar, D. J. (2007). "Role of Receptors in Bacillus thuringiensis Crystal Toxin Activity". Microbiology and Molecular Biology Reviews. 71 (2): 255–81. doi:10.1128/MMBR.00034-06. PMC 1899880 . PMID 17554045. Tabashnik, BE; Van Rensburg, JB; Carrière, Y (2009). "Field-evolved insect resistance to Bt crops: Definition, theory, and data". Journal of economic entomology. 102 (6): 2011–25. doi:10.1603/029.102.0601. PMID 20069826.